Bldg. 508, N. Range Rd. Hilltop Riding Stable offers more than 250 stunning acres of trails for horseback riders. Lessons are offered for beginners to advanced riders. Pony rides and organized trail rides for groups are also conducted. Included in Hilltop's annual calendar are summer and holiday youth horse camps, lakeside trail rides, horseback adventures and education sessions. Hilltop Riding Stable offers recreational activities, business opportunities, private functions, birthday parties and a destination for leisurely family pursuits. Our new conference area is perfect for organizational days, off-site meetings and more. Note: Closed toe shoes are required while riding or leading horses and ponies.This facility closes for inclement weather with no notice (101F). A notice will be placed on the gates and all reservations will be called. Sponsored ID is required for military, DoD civilians and retirees. Children under 13 years must be accompanied by an adult on trail rides. Hilltop Riding Stable is the perfect place for a fun-filled birthday party for children. Reservation times are 10 a.m. to 12 p.m. and 2 to 4 p.m. Party/group accommodations must be reserved in advance. Ponies are on pony carousel. Call today to make your reservations. Hilltop requires the following for incoming horses 5 working days before arrival. All information can be faxed to Hilltop Riding Stable at 706-791-0010. 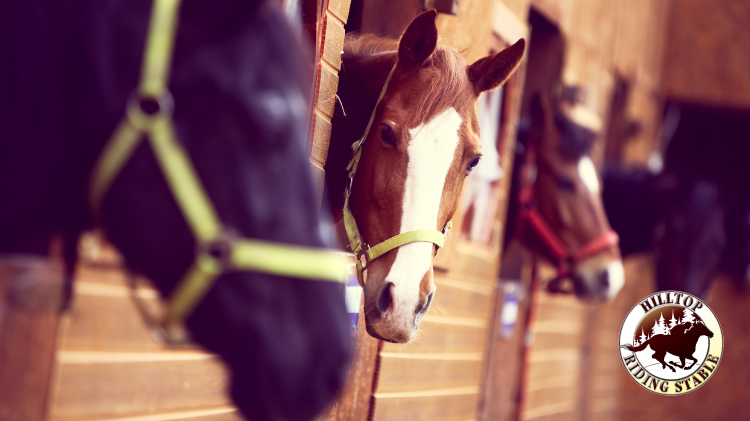 Download the Standing Operating Procedures (SOP) for Boarding Horses. Note: Availability of stall or boarding acceptance is not guaranteed. All boarding must be approved by the Facility Manager. Stall Shavings Package: If shavings are requested in the stall, an additional charge of $50 per month will be added to the above Partial Boarding Package. This additional fee includes the initial shavings, only a daily "quick pick of visible manure" in the stall, and 1 total stripping/cleaning per quarter. If additional shavings are requested during the month, a fee of $10 per bag requested will be charged. Any additional amenities (special requests, services, medications, etc.) will be at the expense of the owner. Stall Shavings Package: If shavings are requested in the stall, an additional charge of $50 per month will be added to the above TDY/Deployment Boarding Package. This additional fee includes the initial shavings, only a daily "quick pick of visible manure" in the stall, and one total stripping/cleaning per quarter. If additional shavings are requested during the month, a fee of $5 per bag requested will be charged. Hilltop Riding Stable has over 10 miles of designated riding trails for horse enthusiasts. The facility has trails for all levels of riding, from the young child to the experienced adult. Trails include heavily wooded areas for brush riding or open trails for a relaxing experience. Riders often spot deer, raccoons, birds, and other wildlife. Come out and enjoy a wonderful day on our trails. Parking is limited to 12 trailers per day. All trailer parking is first come, first served. Sunday-Saturday: 8 a.m. to 4 p.m.
All riders of this facility are governed by the rules and regulation of Fort Gordon and U.S. Army. All riders will be asked to supply a current Coggins /shot record, read and sign harm and hold release for the use of this facility before unloading horses. Failure to supply these documents to the facility office or to agree to the hold and harm releases and abide to all rules and regulation set forth, will be denied access to this facility. All riders will be supplied with a copy of the rules and the Standard Operating Procedures (SOP’s) for this program. Stay on marked trails at all times (No entry into unauthorized areas). Privately Owned Horses are not authorized at any other area on Fort Gordon. Fort Gordon is a training post. Active live training areas do surround the stable grounds. Going into these areas will result in permanent expulsion of all riding privileges. 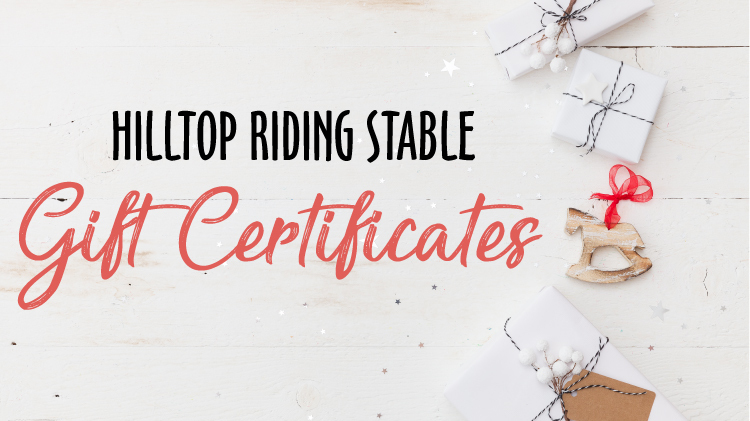 Hilltop Riding Stable holds the right to refuse trail riding to anyone not following regulations or rules. Saturday: 9 a.m., 10:30 a.m., 12 p.m., 1:30 p.m. and 3 p.m.
Sunday: 9 a.m., 10:30 a.m. and 12 p.m.
Sunday Lakeside ride: 2 p.m.
*On Holiday Weekends, open rides are available Friday through Monday. Sunday: Mount-up time is 1:30 p.m. | Trail ride starts at 2 p.m.
Special assistance riding is for children, adults and wounded service members. Licensed physical therapist may accompany guests and provide staff with instructions. Ponies are led by parents. Weekday riding requires reservations. All trail rides are on a first come, first serve basis. Trail Rides go out promptly at the designated times. Arrive 30 to 40 minutes prior to the trail ride starting for sign in procedures. Open to the public, ages 7 to 13. 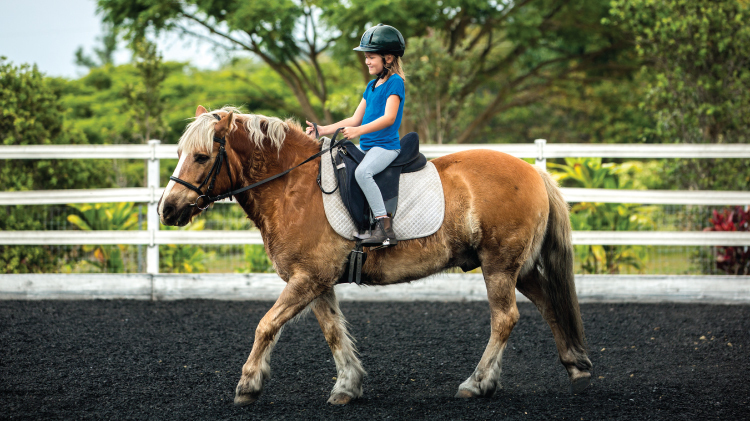 Children will learn riding, grooming, care and tack as well as camp activities. All camps begin at 8 a.m. and end at 4:30 p.m. Drop off for camp begins at 7 a.m. and pickup begins at 4:30 p.m. All children must be picked up by 5 p.m.
All reservations for horse camp must be made in person at Hilltop Riding Stable (HTRS) office during normal business hours. All payments for camp must be made to IMWRF and received by the HTRS office no later than 1 p.m. on the Saturday 2 weeks from when the camp session you are paying for starts. Registration forms can be obtained at the HTRS office. Children attending Youth Horse camps should bring a swimsuit (season permitting) and a change of clothes each day. Please have all children dress properly for the weather. Children should also bring a lunch/snacks packed in a cooler. A locker will be provided for each child. We ask that children do not bring any valuables with them. Hilltop staff will not be responsible for any lost or missing items. For camp dates, please refer to the Hilltop Calendar at the top of this page.